The popular physicist weighs in on climate change, Mars colonies, immortality, and more. Ray guns. Starships. Aliens. 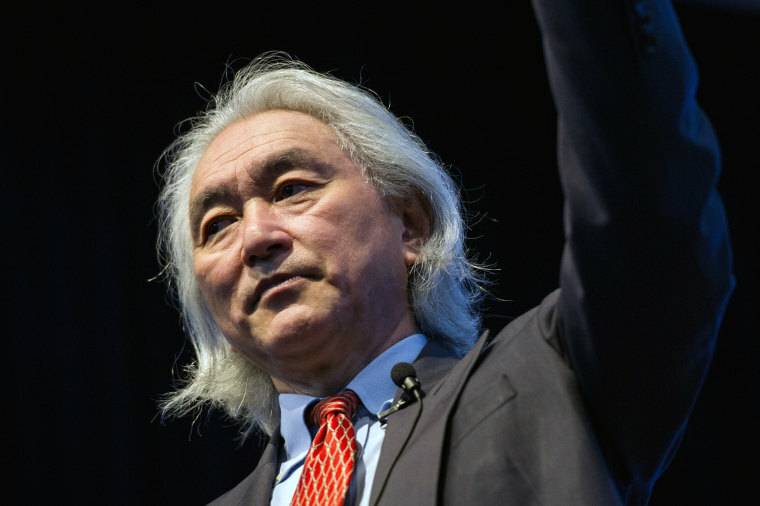 Michio Kaku has been thinking about futuristic things since he was a child in northern California, watching Flash Gordon and trying to understand Einstein. He knew at an early age that he wanted to be a physicist because, as he puts it, they "invent the future" by developing new technologies. "I began to realize that... the engines of the 20th century, every single one, can be traced back to some unnamed physicist toiling in his or her laboratory, creating the internet and creating rockets and creating all the wonder of the Space Age," he says. "I wanted to be part of that." Kaku got his wish, of course. He grew up to be not only a physicist but a famous one, known as a co-founder of string field theory as well as a popular science communicator. And he's written a dozen books on science-themed topics, including the newly published "The Future of Humanity: Terraforming Mars, Interstellar Travel, Immortality, and Our Destiny Beyond Earth." Recently, I sat down with Kaku to discuss his eye-popping and, for the most part, upbeat predictions about life in the decades and centuries ahead. Here, edited for clarity and brevity, is our conversation. David Freeman: "The Future of Humanity" seems to be mostly about space. Is our future really going to take place on other worlds? Michio Kaku: We like to think of Mother Nature as being nurturing and friendly, but 99.9 percent of all life forms on Earth eventually go extinct. Extinction is the norm. It's almost a law of physics that one day Mother Nature will destroy Earth. We see that because of natural disasters, asteroid impacts, supervolcanoes and ice ages. But there are self-inflicted disasters as well — global warming, nuclear proliferation, and germ warfare. No one is talking about evacuating Earth and going to Mars. I want a plan B just in case Mother Nature turns on us, or the folly of humanity gets out of control. DF: Elon Musk, Stephen Hawking and others have said humans need to become a multiplanet species. You're in that camp? MK: Yeah, strongly. That's right. DF: What's the scariest thing facing humanity right now? MK: The scariest things are the self-inflicted problems. We're at the point where we can terraform Earth — that is, we can alter the climate. I would prefer to terraform Mars and make it hospitable to earthlings, but we're terraforming Earth right now, which is a terrifying thought. DF: But you've said that as fusion and other alternative energy sources are developed, climate change may pose less of a threat in the future. Do you see global warming as a blip that we've got to pass through — or an ongoing problem? MK: It is one of the major problems facing us now, but I see light at the end of the tunnel. In southern France we have the ITER fusion reactor, which is an ace in the hole. This $10-billion project will hopefully show that seawater could become the ultimate source of energy on Earth. Fusion is relatively nonpolluting and does not create nuclear waste or melt down like fission reactors. Second of all, the price of batteries is going down dramatically. We forget that the bottleneck for solar power is storage. We think it's the solar cell, but no, it's the battery. When the sun doesn't shine and the winds don't blow, you're stuck. But now we're making enormous inroads, creating super-batteries. I think that could change the economics of solar power very rapidly so that it is fully competitive with fossil fuel technology. DF: As for terraforming Mars, how would we do that? MK: We'd do it in steps. When we land on Mars we use lava tubes, caves that already exist, for our shelter. Then we mine the ice, separate out drinking water and then oxygen and hydrogen — oxygen for breathing and hydrogen for rocket fuel. Then we create agriculture. We genetically modify plants to thrive in the cold Martian conditions. I expect we'll have solar mirrors in outer space beaming energy to the polar ice caps, melting the polar ice caps because there's plenty of water on Mars, except most of it is frozen. Mars once had great rivers, it had seas, and we think it had an ocean roughly the size of the United States. So Mars at one point was potentially a lush planet. By melting the polar ice caps, we can start this process. If we could raise the temperature by six degrees centigrade, a runaway greenhouse effect could be initiated. DF: What if there's already life on Mars? MK: First, we have to make sure we're the only game in town on Mars. We have to make sure there's no microbial life, because our DNA would interact with foreign DNA with unknown consequences. And we have to make sure there's no intelligent life because we all know what happened when Cortez met Montezuma. It was not very pleasant. The Aztec Empire was destroyed within a matter of months, and we don't want a repeat of that. But the latest indication is that Mars is sterile. We don't see any evidence of even microbial life. DF: But you think life is abundant throughout the Milky Way? MK: I think it's inevitable. On average, 100 percent of the stars you see at night have planets going around them. When you look in the night sky tonight, realize that somebody could be looking back at you, wondering if there's life on this solar system. I think it's inevitable that we're going to find evidence not just of life but also of intelligent life because our galaxy has perhaps billions of Earth-like planets. DF: How many exoplanets have we actually identified? MK: Four thousand planets have been cataloged and verified. The number of Earth-like planets is about 20. However, we think there could be billions of Earth-like planets out there in our own backyard. DF: When do you think we will encounter alien life? MK: I think we will pick up a signal from an intelligent civilization in outer space in this century. However, that doesn't mean we'll have a two-way conversation. They could be many hundreds of light-years away, so it would take hundreds of years for a conversation to take place. But when that takes place, when we do eavesdrop on an intelligent civilization in outer space, that could be a turning point in the history of civilization on Earth. DF: A recent paper suggests that encountering alien life wouldn't cause much of a reaction. Is that what you think? MK: If we encounter an intelligent species in the universe, the first thing we would have to do is find out whether they're a Type I, Type II, or Type III civilization. A Type I civilization is about a hundred years more advanced than we are. They are planetary. They control the weather, for example. Type II is stellar, like "Star Trek." They control the stars and are a few thousand years ahead of us. If they're Type III, they're galactic like in "Star Wars." They roam the galactic space lanes. They control black holes and are perhaps on the order of a hundred thousand years plus more advanced. Once we intercept their message, the first thing we have to do is figure out how advanced they are. Because we are Type 0, and if we meet them it's like you meeting a squirrel in the forest. Do you go down to the squirrels and try to talk to them? Initially, you do. But then you get bored because they don't talk back. Squirrels have nothing to offer us. DF: How do you think an alien encounter would play out? MK: There's a possibility that they'll land on the White House lawn and announce their existence and initiate an Age of Aquarius. I don't think so. I think for the most part, they're going to leave us alone. If they want minerals, they can plunder other uninhabited planets that have no restive natives, so they don't have to plunder Earth. I think for the most part they'll probably consider us a curiosity. DF: If Elon Musk gets his rockets ready, would you move to Mars? MK: I would not. I think the first people to go to Mars are going to be heroic. They're probably going to be test pilots or people with lots of experience going into very dangerous situations. They'll realize that, yeah, there's a certain fraction of our space probes that don't make it. One percent of our rockets blow up or malfunction disastrously, so I think you've got to be a pretty hardy person to face all the hazards of going to Mars. DF: But you think that eventually we will have a colony on Mars? MK: Yeah, I think so because the economics have changed. You know the movie "The Martian" with Matt Damon? That movie cost $100 million. It costs $70 million for the Indian government to go to Mars. It cost more money for Hollywood to make a film about going to Mars than actually going to Mars. I think when the Oscars take place, they should give a special award for the best supporting space probe, because Hollywood movies cost more than trips to Mars. That's how much the price has dropped dramatically. It's a new ball game. DF: Let's talk a bit about life here on Earth. What's life going to be like 10 years, 20 years in the future? What big change is coming? MK: In the area of biotechnology, I think we're going to extend the human lifespan. We're now isolating the genes that control the aging process. We've even found an enzyme called telomerase, which immortalizes cells, so your skin cells divide 60 times, then they go into senescence and they eventually die. There's a clock in every skin cell in your body. We can reset the clock with telomerase. But there's a problem why we don't do this now. It's because cancer cells also immortalize themselves. Artificial intelligence will seal the deal. We'll take millions of genomes from old people, millions of genomes from young people, and see where the aging takes place, and we'll do that using artificial intelligence to recognize millions and millions of sequences of DNA. I think that, for example, in a car, where does aging take place in a car? Well, where do you have moving parts and where do you have combustion? The engine. So aging takes place in the mitochondria of your cells because that's where we have moving parts and that's where we have combustion and oxidation. That's where errors build up. Aging is the accumulation of errors, so we'll fix those errors with gene therapy. I think our grandkids will have the option of hitting the age of 30 and maybe stopping for many, many decades at age 30. DF: Will that be a good thing? MK: At first you think "Oh, my God, we're going to overpopulate ourselves." But look at Japan. It's had the opposite effect. The Japanese people live longer. The population has fewer children, and the population is contracting at a half a million people per year. By mid-century, it'll collapse at one million people per year. Europe is next. Germany, Switzerland, Austria — their birth rate is falling just like what was happening in Japan. I think as we conquer the aging process, we'll find that instead of exploding, we'll have an S-shaped curve. It'll seal off and I think we'll have a stable population in the future. DF: In addition to stopping the aging clock, you've spoken about the possibility of putting human minds into robots. DF: Is that an alternative version of immortality? MK: We're going to have the Human Connectome Project map the human brain before the end of this century, I think. We're going to put the connectome on a laser beam and shoot it to the moon. In one second, our consciousness is on the moon. In 20 minutes we're on Mars, eight hours we're on Pluto, in four years our consciousness has reached the nearest star. DF: Connectome being the map of all the neurons in your brain? Now, believe it or not, I personally believe that this could already exist. If aliens are already Type I and Type II, they already laser-port their consciousness across the galaxy. They don't bother with UFOs. Flying saucers, my God, that's Type 0 technology. DF: Some people are beginning to worry that robots are going to steal our jobs and reach a level of intelligence where they'll turn on us. Do you worry about those things? MK: No. They'll take some jobs that are repetitive, but jobs that are semi-skilled like plumbers, gardeners, garbage men, sanitation workers, they'll have jobs many decades into the future because robots cannot pick up garbage. Robots do not have pattern recognition. They cannot identify a crime. They cannot fix your toilet. On the internet, you can see these robots — the finest robots that we can create — falling over and acting like an upside-down turtle. Robots today have the intelligence of a cockroach. By the time they're as smart as a monkey, that's when they're dangerous because they have self-awareness. They know they are not humans. DF: When do you think robots will become as smart as a monkey? MK: I think by the end of this century we'll have robots as smart as a monkey that understand that they are not human, that they are distinct from humans. DF: What happens then — all bets are off? MK: We should put a chip in their brain to shut them off if they have murderous thoughts. DF: Maybe they'd have a way to get around that. MK: I think for this century we're okay. But for the next century, once robots can remove that chip in their brain, I think we should merge with them. DF: For all the possible pitfalls, you sound optimistic about our future. Why? MK: In the last century, life expectancy for Americans in 1900 was officially 49 years of age. We were born, had kids, and died. Our grandparents, when they wanted to talk to people long distance, they would yell out the window. If they wanted to travel to meet their friends, they got stuck in the mud. It was not pleasant living a hundred years ago. So when I look at history decade by decade, I see this tremendous explosion of wealth, prosperity, telecommunications. We live like kings compared to our ancestors. If you took someone from 1900 and showed them today's technology, they would consider us wizards and sorcerers. Now, if you take one of us and have us see our grandkids in the year 2100, we will consider them to be Greek gods. Zeus could have his thoughts come to reality. We'll have that. We'll think of things, and things will come true. I think we will live like Greek gods in the future. DF: But for all the advances and all the sorcery, won't it feel pretty much the same to be human, emotionally speaking? MK: We are genetically hardwired to be grouches, to be curmudgeons. Why? Because our ancestors who did not complain did not survive. They didn't ask for extra resources. They didn't ask for extra help, even when, during the Middle Ages, most people died very early. I think our ancestors bellyached a lot. Our ancestors were fearful. Our ancestors, believe it or not, were fearful, bellyaching monkeys. MK: They'll live like gods. DF: But they'll still be programmed to be grouches. MK: That's right. They'll bellyache.